The Deloitte/SEB CFO Index for spring 2017 increased from 54.1 to 58.2 - which is the most positive result since May 2011. The survey shows a marked increase in optimism among Swedish Chief Financial Officers. Above all, CFOs in the manufacturing sector - which used to be the least positive sector - show much greater optimism. "The former notable difference in optimism between companies with domestic and international focus is no longer there. This suggests a broader recovery in the Swedish economy, where growth for the manufacturing sector has improved with increased international demand," says Karl Steiner, Senior Strategist at SEB. The external uncertainty is seen as somewhat lower now than in autumn, and companies show generally less concern about factors that could affect them. Above all, worry is decreasing for negative impact from macroeconomic and political factors. This shows good resilience toward the troubling political situation of a new US President with a not quite fully known economic agenda and the important upcoming elections in Europe. As for the cost of raw materials, worry has increased, which is natural given the large cost increases that various indicators have shown in the past six months and which are a further sign of increased demand and stronger growth. Just as company's anticipated last autumn, M&A activity has remained at very high levels. In line with other studies, CFOs maintain M&As as a top priority for the next 12 months, and in this spring's survey, there is also a greater willingness to invest abroad. "An additional sign of rising optimism is that CFOs express a greater willingness for new recruitment. As many as one-third of respondents plan to increase the number of employees in Sweden over the next six months, which is the highest proportion since 2011," says Henrik Nilsson, Partner at Deloitte, adding that this is an offensive sign after several years with focus on cost cutting and efficiency improvements. The survey shows that a large percentage of companies have suffered cyber threats (69%), but there is great potential for improvement in how these are managed. Only a small proportion (14%) consider themselves to be very well equipped to identify and deal with such threats. 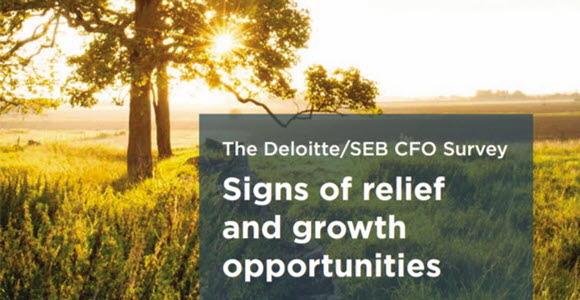 The Deloitte/SEB CFO Survey aims to reflect changes in sentiment among Swedish financial officers and thereby create an understanding of economic and financial trends. It is published twice a year. The full report is available at www.sebgroup.com/press and www.deloitte.se. The survey was conducted during February and had a total of 17 questions on areas such as business climate, strategic priorities, labour, financial strength, and lending attitudes among banks and financial institutions.